If you watch shows devoted to home buying and remodeling, you know that wood floors are a very hot commodity. In fact, real estate experts at Zillow place wood floors as the fourth most important thing buyers desire when shopping for a new home. Scott McGillivray, host of Income Property, moves hardwood floors up to the number 1 gotta-have-it position, noting that because of their popularity, wood floors are also one of the top renovations likely to produce good returns on initial investments. There are many reasons behind the popularity: Unlike carpeting, which is perceived as a catchall for germs, dirt, and pet hair, wood floors are seen as clean (or easy to clean, refinish, or paint) surfaces. Since many have been around for centuries, wood floors hold the promise of longevity and contribute a sense of warmth and timelessness to old and new interiors. They are naturally beautiful and, when handled with care, stand up to high-traffic households. Whether you're looking for hardwood, pine, engineered wood, or reclaimed wood flooring, you will find a wealth of options available at varying price points. But be sure to do your homework before buying. Wood floors are a big investment of money and time. Uninstalled solid hardwood flooring ranges from around $3 to $10 plus per square foot; uninstalled engineered wood floors commonly range in price from about $2 to $6 a square foot. Flooring showrooms and home improvement centers stock a wide selection of solid and engineered wood floors suited to installation by DIYers and construction professionals. Solid wood flooring is crafted from boards created from strips of wood cut from a harvested tree. They stand up to time and traffic and look better as they age. Ranging in width from 2-1/4 inches to 5 inches, solid wood floors are available in nearly a dozen wood types in as many finishes. They can be sanded and refinished, are sold prefinished or unfinished, and because they are adversely affected by humidity, are best for spaces above ground level. Solid wood floors should be installed over a wood subfloor, but they can be installed atop concrete with proper preparation. Engineered hardwood floors are constructed of several thin layers of wood that are fused together in cross-ply fashion, which alternates layer placement to ensure the surface doesn't change with expansion and contraction. More affordable than solid wood, engineered wood floors also offer a wider selection of wood types and integrated finishes. Because they are resistant to humidity, they can be installed on all levels of a home and over most surfaces. Some engineered floors are available as click systems: boards are clicked together to create a floating floor that requires no nails, staples, or adhesive. Bamboo flooring and cork flooring also fall into the wood flooring category. Bamboo, which is crafted from quick-growing and easily replenished bamboo stalks, supplies the makings for durable, low-maintenance, eco-friendly flooring. Cork is a highly renewable resource that is harvested from a cork tree's bark -- no trees are cut down to create the flooring. The material is valued for its sound-absorbing, cushioning, and moisture-resistant properties. The wood flooring category continues to evolve in response to consumer demand. Nearly every conceivable wood type is available in solid wood or engineered wood flooring; many copycats are available as affordable wood laminate flooring styles. Classic maple, oak, mahogany, hickory, walnut, pine, and cherry can be found in solid wood flooring and engineered wood flooring. Brazilian cherry, acacia, tiger wood, and eucalyptus remain popular, thanks to their distinctive grain patterns and rock-hard durability. You will find most wood flooring offered in various light, medium, and dark finishes. Colors range from natural to ebony, with red-, brown-, and golden-shaded surfaces satisfying traditional tastes. But finishes go beyond just color. Narrow boards, wide solid wood planks, and engineered wood flooring are often blasted to the past with distressed patinas created with wire brushes and scrapers; these rustic floors are ideally suited to old-world, country, industrial, and cottage styles. Matte finishes complement most every style, while glossy finishes enhance formal spaces. The available variations expand as more and more homeowners and designers rely on flooring to establish or underscore specific design styles. Gray appears in impactful ways as driftwood, frosted, and ashy tones in all types of wood flooring. 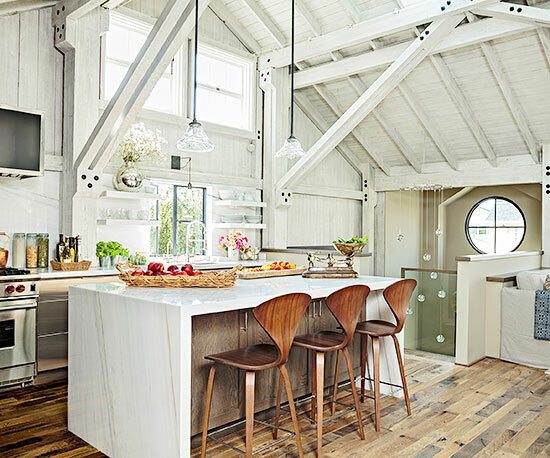 Barely there natural stains and whitewashed finishes give both solid and engineered wood floors an airy outlook that -- like their pale gray counterparts -- reflect light and balance dark cabinetry, while making smallish rooms feel larger. Black-toned finishes satisfy contemporary-loving homeowners. Solid wood and engineered wood flooring sporting ebony finishes warm up streamlined spaces, but also beautifully anchor posh textiles and saturated jewel tones in traditionally chic interiors. Hardwood and engineered wood floors will last through many lifetimes when you put proper protection and maintenance measures into play. Position door mats at entry doors to prevent damage from tracked-in dirt and moisture. Protect floors against scratches, dings, and dents by placing floor protectors beneath furniture and laying down area rugs in kid's play spaces. Regularly dust floors with a mop treated with a dusting agent; vacuum floors weekly using a vacuum equipped with floor-brush attachment. Damp mop floors with plain water as needed, making sure no water is left to puddle on the floor -- wood floors are easily damaged by sitting water. Immediately wipe up all spills, and use water-dampened microfiber cloths or sponges to spot-clean solid hardwood and engineered wood floors. Wood floors will need a few deep cleanings each year. Add a wood-cleaning product, per manufacturer's directions, to a bucket of water. Wet a sponge or mop; wring it almost dry before damp-mopping the floor. Rinse the wood floors with a clean mop dampened in clear water, but only if the cleaning product requires it. Use a soft clean cloth to wipe surface stains from hard-finished or polyurethane wood floors. Never use sandpaper, steel wool, or harsh chemicals on sealed surfaces because they can permanently damage the finish. Older floors with oil finishes are more susceptible to ingrained stains, which can be removed with a little elbow grease, No. 000 steel wool, and floor polish; note that you may have to refinish the cleaned areas after removing the stains.